There’s no doubt “The Jungle Book” is one of Walt Disney’s classic films. In fact, it was among the last feature films he personally oversaw before he passed away in 1966, just a few months before the movie’s debut. Now on Blu-ray, Disney has given this cherished film the “Diamond Edition” treatment it deserves, with lengthy extras that are fascinating, funny, and well worth buying the release for. In high-definition, “The Jungle Book” looks great without any visual noise or really anything to complain about. It’s a nearly perfect presentation of the film, offering toe-tapping music in crisp clarity. Two introductions are offered on the release, one a brief appearance from songwriter Richard Sherman and the other featuring the late Diane Disney Miller’s last in a series of such introductions she recorded before her recent passing. It’s certainly said to think that the daughter of Walt and Lillian Disney will no longer be so prominently featured on future releases. Fortunately, the introduction isn’t the only place on the Blu-ray release that we see Diane. A wonderful conversation between her, Richard Sherman, and animator Floyd Norman includes interesting and amusing anecdotes about Walt Disney’s involvement in making “The Jungle Book” as well as a few stories about how he behaved at home with his family. But smiles quickly turn to tears as the topic of Walt’s death comes up, followed by the immediate realization that also Diane is no longer with us. Thankfully this, other Diamond Edition release, and the Walt Disney Family Museum in San Francisco will help preserve her legacy alive. As with previous releases, a new “@DisneyAnimation” bonus feature offers a glimpse inside the halls of Walt Disney Animation Studios, narrated by a few young animators who describe a “Spark” program that is designed to ignite creativity among everyone who works there. It’s a fascinating look at how Disney continues to encourage growth and innovation. More new bonus features include karaoke and trivia alongside plenty of inherited extras from past DVD releases. Even if “The Jungle Book” isn’t a personal favorite film, all Disney fans should pick up this “Diamond Edition” release if only for its brilliant and touching extras. 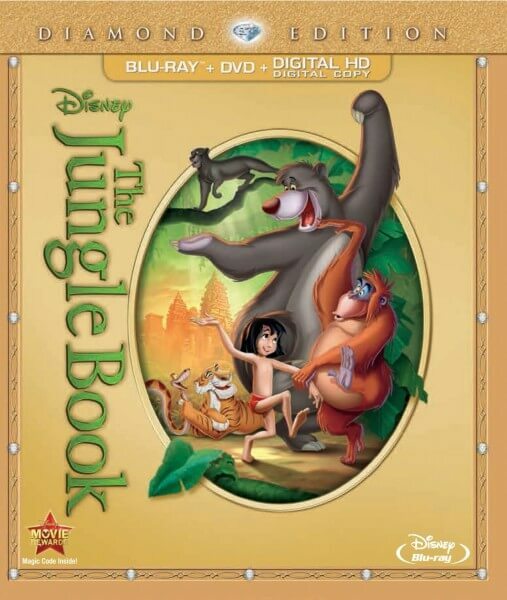 “The Jungle Book” is available on Blu-ray starting today. Does anyone know if the picture is cropped in this version the way it was with the DVD release or has it been restored to the original 4:3 aspect ratio? Loved the special featurette with Diane Disney Miller, Richard Sherman, and Floyd Norman. Also the behind the scenes special about Animal Kingdom was surprisingly cute. Definitely glad I bought this release. and i waѕ just cuгious if you ɡet a lot of spam responses? If so how ԁo you stop it, any plugin or anything you can recommend? I get so mucҺ lately it’s driving mme insane so any support is very much appreciated.